Risotto comes alive in this healthy vegetarian dish that pairs the crunchy freshness of cauliflower with the savoury kick of morel mushrooms. Cook the egg in the water bath at 65 degree celsius for 40mins. Crack open the egg upon serving, removing the egg white. In a pot mix water, Knorr Vegetarian Seasoning and bring to boil. In a sauté pan heat up olive oil and sweat onion. Add in rice and sweat it until translucent. Add in 250ml Vegetable stock, mix well and bring to boil. Gradually add in vegetable stock into rice and cook to to al-dente. Fold in cream and cheese and set aside. Heat up oil to 180 degree Celsius and deep fry the parsley till dry and crispy, season with salt. Pan sear the sliced cauliflower on both side until they are golden brown and season with salt and pepper. Blanch the chopped Cauliflower in salted water. Cut the pearl onions in half and roast them in the oven at 160 degree Celsius for 7 mins. Garnish with sliced onion, coriander leaves. Heat up pan with some olive oil and sauté the morel mushroom. Season with salt. In another pot, bring sherry vinegar to boil and reduce to half, season with sugar. Slow whisk in olive oil and fold in sautéed morel mushrooms. Heat up oil to 180 degree celsius and deep fry the parsley till dry and crispy, pat dry. In a blender, blend olive oil and fried parsley till smooth. Strain the puree with a mousseline cloth to extract the oil. Scope a portion of risotto onto the serving plate, place egg york over the risotto. 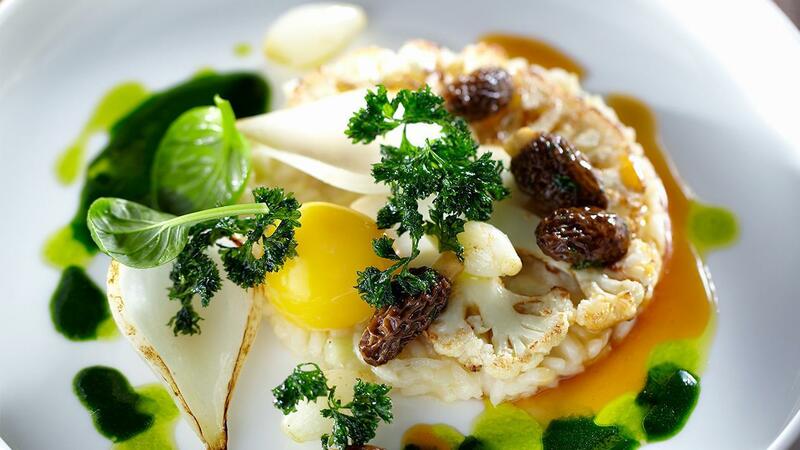 Garnish with sliced cauliflower, chopped cauliflower, roasted pearl onions and fried parsley. Drizzle a spoonful of morel mushroom and sherry vinaigrette. Lastly add a few drizzle of parsley oil.